Forever Young On My 750 Honda Shadow Aero! I started riding in April, 2009, when I was 51 years old. I was a passenger behind my husband, and wanted to know how to ride. We had an accident in 2008, which landed me in the hospital over night. Thank goodness for my helmet! I still wanted to ride, so I bought my 750 Shadow in April, 2009. I took our local ABATE class and love riding. I slide into a guardrail on a steep curve in southern Indiana, and the only thing I kept thinking about was my beautiful bike. I rode 70 miles home on my crashed bike, with no rear brake, no windshield and a really messed up 3 month old bike. I cleaned myself with a first-aid kit I carry while my husband made my bike ride-able. I didn't really want to ride home, but I got on, and did it, bleeding from road-rash on my elbow and knee. My beautiful Shadow was repaired and I've been riding with my husband and my best friend who also purchased a Shadow Aero. My shadow has snake-skin flames, Vance & Hines pipes, a bunch of chrome, and I am still adding accessories to make my ride even more special. At 52, and two accidents, I still get on, and love it!!! 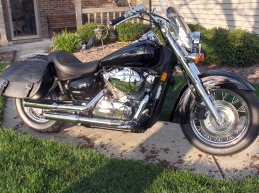 Comments for Forever Young On My 750 Honda Shadow Aero! Good for you to get back on your bike after an accident. I just received my M status on my license and so far my longest ride has been to Michigan City from South Chicago. I have riden downtown Chicago a couple of times and Lake Shore Drive. I love riding but seem to get a little scared when it comes to the deep turns off the ramp. You are an inspiration for me to keep trying and don't give up! I own a 750 Honda Shadow Aero 2002. Congrats! It takes a lot to get back on and especially to learn how to ride a bike after a wreck. Glad you got back on the bike....The ABATE programs are wonderful. And our Shadows are good bikes. WHOW stands for "Women Her OWN Wheels." Enjoy life to the fullest.